In the midst of such a debate, it may be helpful to consider why Calvin said what he said about worship. This essay argues that when Calvin ranked worship first in the need of reform, he did so because he understood worship to be that supreme act for which humans were created. In order to examine this thesis, a concise observation will be made of Calvin’s theology of worship, his identification of idolatry in the medieval church, and some of his reforms of the worship service. Let us now see what is meant by the due worship of God. Its chief foundation is to acknowledge Him to be, as He is, the only source of all virtue, justice, holiness, wisdom, truth, power, goodness, mercy, life, and salvation; in accordance with this, to ascribe and render to Him the glory of all that is good, to seek all things in Him alone, and in every want have recourse in Him alone. Hence arises prayer, hence arises praise and thanksgiving – these being attestations to the glory which we attribute to him. This is the genuine sanctification of His name which He requires above all things…That in these things consists the true and sincere worship which alone God approves, and in which alone He delights, is both taught by the Holy Spirit throughout the Scriptures, and is also, antecedent to discussion, the obvious dictate of piety. For this reason, Calvin was adamant that Christian worship must be according to Scripture. If worship is that piety and highest good for which God created and redeemed his elect, God’s Word alone should be its governor. This, indeed, was of the marrow of Calvin’s theology of worship. Never was there a method of worshiping God, not even from the beginning, which allowed for human invention in worship. The Lord would have us “at once reject all human devices which are at variance with his command,” said Calvin. This sort of regulative principle of worship was quite different from Martin Luther’s, which allowed for whatever God had not expressly forbidden. Calvin, on the other hand, insisted that Scripture should regulate worship in such a way that nothing be permitted except what God has commanded. For the Genevan churchman, worship that was lawful was only that which God had established by his command. On the other hand, whatever men did in worship by the imagination of their hearts was unlawful and illegitimate, nothing more than mere idolatry. This great sin, condemned by God in the first two commandments of the Decalogue, was precisely that of which Calvin believed the church in his day to be guilty. For Calvin, lawful worship was spiritual worship. He understood this to be the meaning of Christ’s words in John 4 regarding worship offered “in spirit and truth.” While spiritual worship in the Old Covenant was “wrapt up in figures,” it is in the New Covenant “naked and simple.” Calvin believed, therefore, that spiritual worship in the New Covenant always has the characteristic of simplicity. The medieval church, however, had nothing of this characteristic, but instead had become “buried under a multitude of superstitions.” Calvin likened the worship of the medieval church to a “new Judaism…reared up by means of numerous puerile extravagances, collected from different quarters.” He sharply criticized the Roman Catholic Church of legislating where God had not and corrupting Christian worship with practices that rob God of his glory. Calvin then turned to the adoration of images, statues, and relics. He claimed that the medieval church invented the distinction of latria and dulia in an attempt to justify its infatuation with idols. The first thing we complain of here is, that the people are entertained with showy ceremonies, while not a word is said of their significancy and truth. For there is no use in the sacraments unless the thing which the sign visibly represents is explained in accordance with the Word of God. Therefore, when the people are presented with nothing but empty figures, with which to feed the eye, while they hear no doctrine which might direct them to the proper end, they look no farther than the external act. Hence that most pestilential superstition, under which, as if the sacraments alone were sufficient for salvation, without feeling any solicitude about faith or repentance, or even Christ himself, they fasten upon the sign instead of the thing signified by it. For Calvin, such unintelligible worship was offensive to God and could only lead to more idolatry and works-righteousness. Luke relates in The Acts that this was the practice of the apostolic church, when he says that believers ‘…continued in the apostles’ teaching and fellowship, in the breaking of bread and in prayers’ [Acts 2.42, cf. Vg.] Thus it became the unvarying rule that no meeting of the church should take place without the Word, prayers, partaking of the Supper, and almsgiving. That this was the established order among the Corinthians also, we can safely infer from Paul [cf. 1 Corinthians 11.20]. And it remained in use for many centuries after. This liturgy, published as The Form of Church Prayers According to the Custom of the Ancient Church in Geneva in 1542, remained in use for many subsequent years. It was, for Calvin, a demonstration of simple, spiritual worship done in accordance with Scripture. Whatever debates on worship continue amongst the theological and ecclesiastical descendants of those believers bearing Calvin’s name (i.e. “Calvinists”), it must be understood that for the Genevan reformer himself, worship was the matter of first priority in the reformation of Christ’s church. While Calvin vigorously sought to bring reformation to the church’s doctrine of justification sola fide, that doctrine which he regarded as the “main hinge on which religion turns,” he nevertheless saw an even greater urgency in the reformation of the worship service. In his famous reply to Cardinal Sadoleto in 1539, Calvin said, “there is nothing more perilous to our salvation than a distorted and perverse worship of God.” For Calvin, the primary place of proper worship was of first importance to guard the supreme sola, namely, Soli Deo Gloria. W. Robert Godfrey points out that “[o]f the three major works by Calvin addressing and defending the Reformation, the ‘Necessity’ is the only one that is not a reply to a previous work. In a reply much of the form and content of the work is determined by the work being answered. But in ‘Necessity’ Calvin was free to present the cause of reform in a way that he regarded as most balanced and effective in communicating to the emperor.” W. Robert Godfrey, “Introduction” to The Necessity of Reforming the Church (Audubon: Old Paths Publications, 1994), v.
 The full quote runs as follows: “If it be inquired, then, by what things chiefly the Christian religion has a standing existence amongst us and maintains its truth, it will be found that the following two not only occupy the principal place, but comprehend under them all the other parts, and consequently the whole substance of Christianity, viz., a knowledge, first, of the mode in which God is duly worshiped; and, secondly of the source from which salvation is to be obtained. When these are kept out of view, though we may glory in the name Christians, our profession is empty and vain.” “The Necessity of Reforming the Church” as found in Calvin’s Tracts and Treatises, Volume I: On the Reformation of the Church (Grand Rapids: Eerdmans, 1958), 126. D.G. Hart and John Muether, With Reverence and Awe: Returning to the Basics of Reformed Worship (Phillipsburg: P & R, 2002), 11. Ibid, 21. For similar arguments by Hart, see Recovering Mother Kirk: The Case for Liturgy in the Reformed Tradition (Grand Rapids: Baker, 2003). John Frame, Worship in Spirit and Truth (Phillipsburg, P & R, 1996), 38-45, 60, 84, 122. See the first seven questions. Calvin’s Tracts and Treatises, Volume II: On the Doctrine and Worship of the Church (Grand Rapids: Eerdmans, 1958), 37-38. Hughes Oliphant Old, “John Calvin and the Prophetic Criticism of Worship” in Calvin Studies Society Papers 3 (Union Theological Seminary in Virginia, 1986), 73. Horton Davies aptly pointed out how this was the main difference between Calvin and Luther regarding the reformation of worship: “The real difference between Lutheran and Calvinist reforms in worship may be summed up as follows: Luther will have what is not specifically condemned by the Scriptures; whilst Calvin will have only what is ordained in the Scriptures. That is their fundamental disagreement. The Worship of the English Puritans (Morgan: Soli Deo Gloria, repr.1997), 16. See also Calvin’s “Reply to Cardinal Sadolet’s Letter” in Tracts and Treatises, vol I, 34-35. Ibid., 131. Cf. Institutes, 1.12.2. See also “An Admonition Concerning Relics” in Tracts and Treatises, 287ff. Ibid., 131-32. Cf. 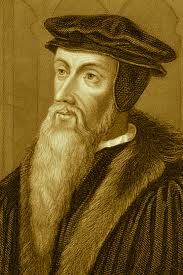 Institutes, 1.11-12; 4.2.7-11; 4.17.36; 4.18.8, 18 “Articles Concerning the Organization of the Church and of Worship at Geneva proposed by the Ministers at the Council” in Calvin: Tracts and Treatises (Louisville: Westminster John Knox Press, repr.2006), 49. This was done in Geneva, but not Strassburg. It was Calvin’s unfulfilled desire that the Lord’s Supper be celebrated weekly. Institutes, 3.11.1. For more on Calvin’s doctrine and high and orthodox view of justification by faith alone, see 3.11-19; his commentaries on Romans, Galatians, Ephesians, and Hebrews; his sermons on Galatians and Ephesians; his treatise responding to the Council of Trent. “Reply by Calvin to Cardinal Sadolet’s Letter” as found in Tracts and Treatises, Vol I, 34.